Austin Peay sat in third after round one before UT Martin (575) and Oral Roberts (576) shot 280 and 281, respectively, in round two to move ahead by four and three strokes, respectively. Host Arkansas State, which put two teams in the field, owns the top two spots in the event with 18 holes remaining. Freshman Chase Korte and sophomore Austin Lancaster posted matching 144s over the first 36 holes to tie for 17th. Korte, who shot 73-71, led the Govs with nine birdies on the day, while Lancaster (74-70) posted Austin Peay’s best round with a two-under 70 on the afternoon. 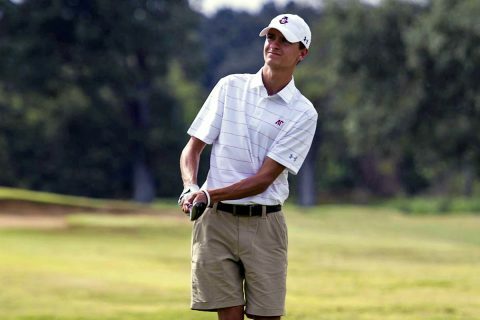 In his first appearance in the lineup this spring, freshman Garrett Whitfield acquitted himself with a 145 (71-74), tying for 22nd; he canned 27 pars to lead to the Govs, one off the tournament-high. Sophomores Alex Vegh (71-75—146; t-25th) and Michael Busse (74-76—150; t-40th) rounded out the Austin Peay lineup; Vegh’s even-par average on par-3 holes was Austin Peay’s best, while he was one of four Govs to average 4.75/hole on par-5, giving Austin Peay a 4.78 team average on par-5s, third-best in the tournament. In addition to being part of that quartet, Busse was one of eight players to eagle on the day, ending his round with a two on the par-4 No. 8 Monday afternoon. Playing as the individual, freshman Jay Fox enjoyed a solid day with matching 76s for a 152 and a share of 51st; included in his 36 holes were five birdies and 31 pars. Final-round action from RidgePointe Golf Club begins with an 8:00am, Tuesday, shotgun start.